Join our Seville to Granada day trip to explore the wonderful city of Granada and visit the Alhambra of Granada in depth, the most visited monument in Spain and nominated to become one of the new Seven Wonders of the World. Acompanied by our official guide, we will visit this amazing monument extensively and explore the ‘Palacios Nazaríes’ (Nasrid Palaces), the Alcazaba, the ‘Patio de los Leones’ (Lions Courtyard), the Palace of Carlos V and the Gardens of the Generalife. We will also enjoy a walk through the narrow and beautiful streets of Granada’s historical centre to discover other settings across the wonderful city of Granada. We will be setting off from Seville early in the morning and we will make a journey across Andalucía until we arrive in Granada. We will then visit the Alhambra of Granada, one of the most popular monuments in Spain which was also nominated to become one of the new Seven Wonders of the World. With no previous queuing, we will visit the interiors of the emblematic Alhambra of Granada. During our tour, we will be accompanied by an official local guide, who will make us familiar with the history and secrets of this monument declared a World Heritage Site by UNESCO. We will also visit other important historical monuments, such as the Nasrid Palaces, the Alcazaba, the Carlos V Palace and the Generalife Gardens. After visiting the Alhambra you will be able to taste the Andalusian gastronomy in one of the bars or restaurants that our guide can recomend or you will be able to enjoy your own meal. After this break for lunch, we will take a stroll along the streets of the historical centre of Granada and through the Albaicin neighbourhood. Accompanied by our guide, you will continue learning the history and curiosities of this city and we will visit other monuments and emblematic spots. After the tour and a brief break, we will back to Seville where we expect to arrive at approximately 19:30 in the evening after having enjoyed a fantastic one-day trip full of history and culture in Granada. Passports or ID number are required. Following the Alhambra security normative, every travellers passport numbers are required. You will be able to give us your passport numbers in the booking process next step. Our package includes: Private transport from your accommodation in Seville. 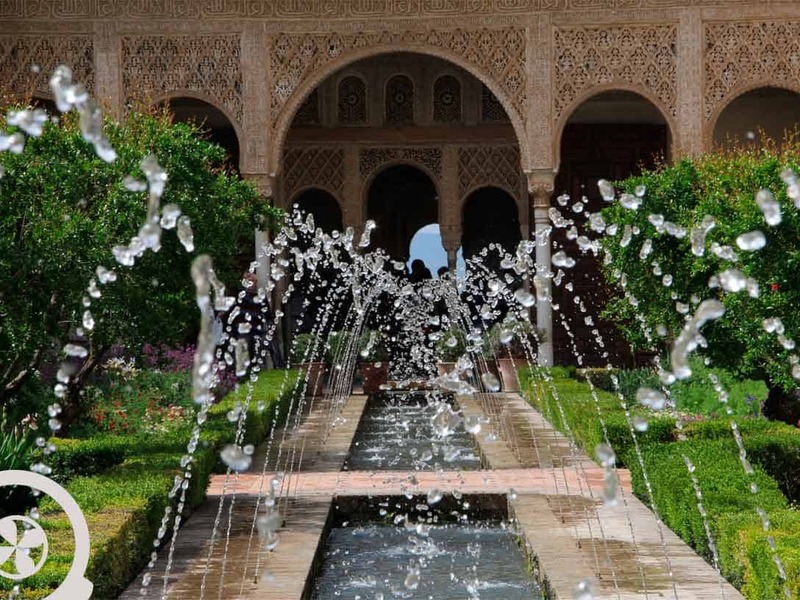 Guided visit and Alhambra de Granada and Nasrid Palaces tickets. Walking tour across the Granada’s histocal centre. Local official guide. Free travel insurance. Booking time limit: 4 days (96 hours in advance). Cancelations: Free cancellation up to 72 hours in advance and 0% cancellations made less than 72 hours in advance. + Information: If you need further details, please contacts us. Good organization,excellent guide wonderful trip. We truly enjoyed the visit to Granada and the Alhambra. Luis the local guide was excellent! I have contacted the company as I was concerned about unsafe morning pickup procedures but they were punctual and we had no problems. I highly recommend this visit. They had spoken very well of Granada and I think that taking advantage of one day of our vacation to visit this city was a great idea. The Alhambra is amazing, although there are too many people in the monument. As for organization, everything was correct. Thanks and see you soon.